In the opening game of the season, AC Milan and Lazio showcased a problem that has become increasingly noticeable in recent Serie A seasons. Miroslav Klose opened the scoring for Lazio after Stefano Mauri crossed from wide right, then they went two up when Mauri once again swung in a cross from the right for Djibril Cisse to head in. Milan then fought back with Antonio Cassano squaring the ball for Zlatan Ibrahimovic, then Cassano heading home a corner kick for the game to finish 2-2. Milan’s goals weren’t a great example of it, but both teams frequently found weak spots down the flanks. It wasn’t the first time Milan’s weakness out wide had been exposed. Knocked out of the Champions League at the hands of Tottenham Hotspur, it was Spurs’ targetting of their full-backs that undid them, working the ball out wide to swing in for Peter Crouch. And neither was it simply in Europe where their shortcomings became obvious: Juventus, Cesena and Roma all beating Milan with their wing play in the league. With these deficiencies so obvious however, how is it Milan managed to win Serie A last season? The answer is that most Italian teams are just as narrow – Juventus, one of the few teams to use wingers in their 4-4-2 under Luigi Delneri last season, have moved to a 4-3-2-1 under Antonio Conte this season, while Internazionale used a 4-2-3-1 in their Champions League win in 2010 but would switch to a 4-3-1-2 for Serie A games – which raises another question: why? The first reason is that Italy has never had a grand tradition of wingers like England has. While English football has Tom Finney and Stanley Matthews, Italy have Bruno Conti and Roberto Donadoni – neither of whom could be described as traditional wingers. The stereotype of Italian football being defensive came from the homogenous use of catenaccio, where the width would come from the full-back or the tornante rather than a winger. This means that Italy are unlikely to develop their own wingers as there would be no point if their clubs don’t use them. Nothing is stopping them from importing wide players from abroad though, so what is it specifically that is stopping Italian clubs from using wingers? fig. 1 - Midfield zones of high (red) and deep (blue) defensive lines. One of the most notable things about Italy’s top sides a few years ago was how old they were. This had numerous knock-on effects but one of the main ones was that the defences had to play deeper to ensure opposition sides couldn’t exploit their lack of pace by playing the ball into the space behind them. This, in turn, stretched the midfield zone, giving them more space in the middle of the pitch (fig. 1). Generally whoever controls the central midfield controls the match, particularly in Serie A’s possession-based game, so the wingers are sacrificed for extra men in the centre of midfield to pack the space. To dominate games, being defensively solid and able to keep the ball are more important than width, so the wingers are a reasonable sacrifice, with full-backs able to take up some of the responsibility for stretching play. It’s the classic examply for the short blanket analogy: Italian teams can’t use wingers without leaving another area bare. Early on in the season under Gian Piero Gasperini, Internazionale used Wesley Sneijder and Diego Forlan wide in a 3-4-3. To make up the extra ground in midfield, Inter’s defensive line pushed up but it wasn’t effective. Slow and undisciplined, the defence were caught out repeatedly by balls in behind and their midfield remained outnumbered and easy to pass around – Inter shuffled their team around to involve wingers and currently find themselves 15th. As the wings are generally a less dangerous area, it’s little surprise that most Italian sides have neglected to focus on them. It could however be said that Napoli’s resurgence in recent years has come through exploiting Serie A’s preference for the 4-3-1-2 formation. Their three man defence allows for a spare man at the back and operates high enough to ensure the two holding midfielders don’t get overrun, while the wing-backs operate higher than most of the opposition’s full-backs, generally making them more effective defensively and offensively. It remains quite depressing that Serie A’s downfall has left a league known for its variation rather stale tactically. Simply identifying the problem doesn’t offer any solutions though, and without the offending clubs simply investing large amounts of cash, I can’t see Italian football progressing pass the impasse it has reached anytime soon. For now, they may just have to make do with the short blanket. I simply don’t agree with this article. 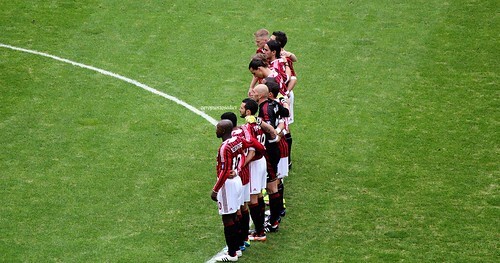 True, champions Milan have attacking options extremely narrow and few other teams too. But when u focus on the lack of width, u have to observe SerieA’s extraordinary number of good central midfielders and trequaristas! Let’s take the example of champions of England, Manchester United. Time and again, everybody talks about their lack of a quality player in central midfield. They make up for it with their wings. Reverse it to serieA. The excellent central midfielders and trequaristas make up for the lack of it. Imagine when the opposition back four in serieA defend so deep and the difficulty faced in unlocking the gaps and scoring gols! Ouch, the midfielders have to be extremely creative and more relative mobility between them. Morever, the serieA clubs are more than realizing their shortcomings. Look at the present league leaders, Juventus. Fine balance between wings and the central midfield (the phenomenon called ANDREA PIRLO) is what is turning them into such a dangerous team. You can discuss serieA’s downfall all day, but the quality isn’t as bleak as some paint it to be. The beauty is there, only if u know how to see it!! Surely most teams should defend in a 4-3-1-2 then in attack have the player in the “1” move to one of the wings and the same with one of the strikers and spread it wide quickly because the opposition full backs are likely to have advanced and left gaps. That’s how Roma beat Milan last season, using Jeremy Menez as a trequartista.